We need your help. Time is running out to stop a horrifying piece of legislation affecting hundreds of thousands of jobless North Carolinians, now and in the future, from becoming law. Please take a stand to STOP the attack on unemployed North Carolina workers and their families. NC has the 5th highest unemployment rate in the country, with three unemployed job-seekers for every available job. There is no doubt that NC families need help, but instead they find themselves under attack simply because they are out of work. Cut the maximum benefit amount by 1/3 to $350 per week: No state has ever made such a severe cut. Cut all benefits by changing to a formula no other state uses. Cut the maximum weeks of benefits from 26 weeks to a sliding scale of 12-20 weeks. Only two other states (Florida and Georgia) do this. Cut benefits for workers who lose their job because of health reasons or family reasons, something ½ the states allow. AND, unbelievably, the bill will cut off federally funded extended benefits that over 80,000 workers now receive as of July 1, 2013. These benefits are 100% funded by the federal government and that bring an estimated $25 Million a week into North Carolina to help families try to make ends meet while unemployed. NO STATE HAS EVER DONE THIS. 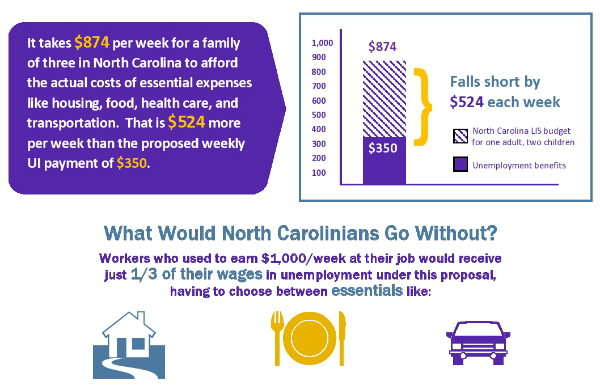 Click here for more background on the North Carolina General Assembly’s extreme and misguided proposal to gut our state’s unemployment insurance system. Use the letters below to contact the House Finance Committee members and Gov. Pat McCrory. You can also email the entire Finance Committee using this link (works best with Gmail and other online services). Call Gov. McCrory directly at 919-733-5811 and tell him to stop the madness on unemployment insurance. Take a stand to STOP the attack on unemployed North Carolina workers and their families.